Collingwood recruited an assistant coach with a storied football resume when hiring Garry ‘Buddha’ Hocking ahead of the 2018 home and away season. Not only has a champion player, Hocking has over 10 years coaching experience at clubs around Australia. He joined the Magpies as an assistant coach, specialising in stoppages. During the 1990s, Hocking was regarded as one of Geelong’s finest players. A tenacious onballer, he was a four-time All-Australian and four-time Geelong Best and Fairest winner. However, his playing career was also defined by a number of near misses. Hocking played in four losing Grand Final teams, and polled top-three in the Brownlow Medal on four occasions. Regardless, his status at Geelong ranks among the elite, with a place in the club’s Team of the Century and Hall of Fame. As a coach, Hocking has a range of experience in different roles and regions. He begun as the senior coach of Peel Thunder in the WAFL, before returning to Victoria in 2006 to lead the Geelong Falcons under-18 side. A return to the elite level came in 2009, when Hocking was hired by Port Adelaide as an assistant coach. In 2012, he took the reins of the senior team after Matthew Primus was sacked as senior coach with four games remaining in the season. Hocking remained at Alberton Oval after the hiring of Ken Hinkley in October 2012 and worked as an assistant coach, and coach of the Port Adelaide Magpies (SANFL) until the end of 2016. 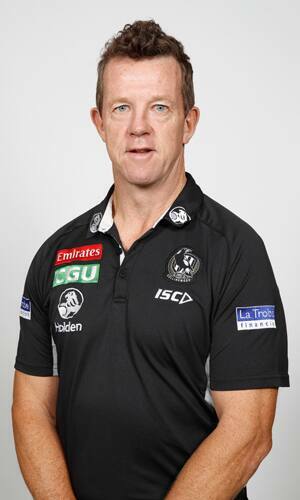 He signed a two-year contract as senior coach of South Adelaide (SANFL) in 2016, but instead chose to re-join the AFL ranks with Collingwood at the end of 2017. Honours: All-Australian (1991, 1993, 1994, 1996), Geelong Best and Fairest (1991, 1993, 1994, 1996), Australian Football Hall of Fame (2008), Geelong Team of the Century (2001), Geelong Hall of Fame.